The DSR70A is an all-in-one portable editing recorder with a 6.4 inch LCD monitor, audio speaker, DMC, jog/shuttle dial and edit function keys. The DSR-70A is also one of DVCAM's Master Series VTRs capable of playback of DV (SP), DVCAM and DVCPRO cassettes automatically without adapters or menu setting changes. 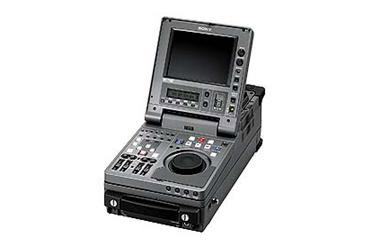 This feature makes it ideal for ENG applications where video is acquired from multiple sources.The DSR70 has an SDI digital interface*, allowing a direct connection with Betacam SX VTRs and an RS-422 remote interface used for professional editing. The DSBK-160A option board provides both i.LINK IEEE 1394 DV I/O and SDI input/output connections on a single option board. *NOTE: Optional interface boards (DSBK-140/150/160/170) cannot be used in combination with each other. However, these boards can be used together with the optional DSBK-180 Dual Video Input Board. Multi-Format Playback Capability The DSR-70A is capable of providing editing playback of DV(SP), DVCAM and DVCPRO format recorded material. The format is automatically identified by the VTR without having to change any menu settings. Internal Signal Generator Incorporating a comprehensive range of analog interfaces for both video and audio, the DSR-70A interfaces with current analog equipment to ensure a smooth transition to digital systems. Composite, S-Video (Y/C) for video, and audio interfaces (via XLR con 16:9 Aspect Ratio Capability By receiving a wide aspect ID signal, the DSR-70A records and plays back 16:9 aspect ratio pictures captured with the Sony DXC-D35WS Digital Video Camera, the DSR-500WSL and the DSR-PD100A DVCAM Camcorders. Vertical Interval Time Code In addition to conforming to the SMPTE time code format, the DSR-70A also supports Vertical Interval Time Code (VITC). This time code is recorded on the video tracks and inserted in the vertical blanking interval. The Vertical Interval Time Code can also Video Process Control The DSR-70A offers control of its video processor for both analog and digital outputs. This provides accurate control of video level, chroma level and chroma phase (hue) for composite, component, S-Video and SDI outputs. Multi-Size Cassette Mechanism The DSR70A has a multi-size cassette mechanism that accepts standard, medium and mini size DV based cassette tapes without the need for an adapter.